Dias to Trumka of the AFL-CIO: "To speak out in solidarity with a president who has proven himself entirely unworthy of the progressive labour movement's support, rather than fellow working Canadians, is deeply concerning." TORONTO -- The president of Canada’s largest union called a major U.S. labour federation’s support of President Donald Trump’s proposed steel and aluminum tariffs “laughable” and “irresponsible” in a scathing letter, showcasing the vast divide between organized labour in North America on the issue. 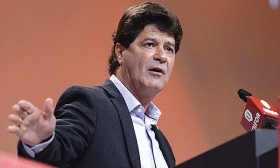 Unifor President Jerry Dias blasted the AFL-CIO’s support for the tariffs in the letter, addressed on Friday to its president, Richard Trumka. Several American unions affiliated with the AFL-CIO, including the UAW, have chapters in Canada, which Dias said Trumka failed to consider when announcing his support for the tariffs. Dias’ public spat with Trumka is a rare instance of two major union leaders speaking out against each other on a major issue in public, as organized labour typically prefers to present a united front. Unifor represents about 300,000 workers in Canada, including nearly 40,000 workers in the auto sector. The AFL-CIO is the largest trade federation in the U.S. and represents several major unions including the UAW, which represents more than 400,000 workers. Critics of Trump’s decision have said Canadian companies might have the most to lose from a potential tariff on steel and aluminum. Canada is the top supplier of steel and aluminum to the U.S., and Canadian companies depend in large part on business in the United States to generate revenue. Trump on Thursday said he planned to impose a 25 per cent tariff on imported steel, in addition a 10 per cent tariff on aluminum. During a meeting with steel executives at the White House that day, Trump said he would impose the tariffs “some time next week.” It is unclear if Canada, the top supplier of steel and aluminum to the U.S., might be granted exceptions to the tariffs. In a statement on Thursday, Trumka praised Trump’s decision to impose tariffs, calling it “a great first step toward addressing trade cheating.” He praised the Trump administration for “effective enforcement” of trade laws, including Section 232 of the Trade Expansion Act of 1962, which authorizes the U.S. Commerce Department to conduct investigations into the impact of trade on American national security. Attempts by e-mail and phone to reach the AFL-CIO for comment on Dias' letter were unsuccessful on Friday. In a phone interview Friday with Automotive News Canada, Dias took issue with Trumka invoking Section 232, mocking him for suggesting Canadian steel and aluminum imports are a threat to U.S. security. “What are we going to do, lob spitballs from Windsor to Detroit? Give me a break,” said Dias, who was in Mexico City for renegotiations of the North American Free Trade Agreement. Dias acknowledged that Trumka must look out for American workers first, but he took issue with the idea that their gains might come at the expense of Canadian labour. While Trumka has yet to say if he supports a Canadian exemption to potential U.S. tariffs, several U.S. unions in support of the measures are lobbying for one. For instance, United Steelworkers President Leo Gerard, a Canada native, has urged Trump to exempt the country. “To put Canada in the same boat as Mexico, or China, or India, or South Korea … doesn’t make sense to me,” Gerard told the Financial Post in an interview. The United Steelworkers is affiliated with the AFL-CIO. Dias said he has no plans to speak with Trumka, with whom he said he has never spoken with. His letter to Trumka said: "I would be happy to discuss this matter further with you." The divide between Dias and Trumka also highlights the complicated relationship organized labour has with the Trump administration. Dias, an outspoken Trump critic, has praised the administration for opening up talks on NAFTA, for instance, while support from blue-collar workers for Trump in the United States has forced traditionally Democratic union chiefs such as Trumka to lay off criticism of the president on some issues. The U.S. automotive industry, which has a heavily integrated and global supply chain, has been virtually unanimous in its condemnation of the proposed tariffs. U.S. automakers have warned prices of vehicles would increase as a result, while suppliers have urged the White House to exempt them from any tariffs, as many rely heavily on imports to build parts. In Canada, meanwhile, the tariffs were met with similar scorn. Flavio Volpe, president of the Automotive Parts Manufacturers’ Association, previously told Automotive News Canada that he expects U.S. customers to pay more for products. The APMA represents Canadian auto suppliers. “The trickle effect to parts and cars that cross the border in the build-up process means we all get punished with higher costs while our new [Trans-Pacific Partnership trade deal] partners, who will sell us wholly assembled across the Pacific Ocean, just got another boost,” Volpe said. Prime Minister Justin Trudeau on Friday called the tariffs “absolutely unacceptable,” while Canada, the European Union and Mexico have each suggested they could retaliate, sparking concerns about a major trade war, one Trump suggested on Twitter he would welcome. Dias said the Canadian government must hit back at the U.S. with its own measures if the tariffs go through on Canada.